Once again, the Steelers are going to the Superbowl. 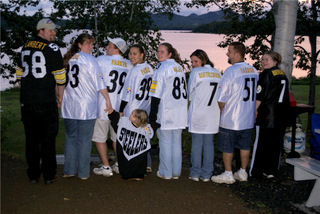 If you have ever stayed with us before, you are well aware that I am a Steeler fan (born with it) and proud of it. SO, for those of you staying with us next weekend, if you wear your black and gold Steeler shirt or wave your terrible towel ON ARRIVAL, we will take $5.00 off. Reports from our guests this week is that there is some amazing riding going on here. “We have not seen a bad trail yet” Ironically, 2 of the guests are from RI where they are getting the majority of storms. Anyhow, one went south to Eustis the other day and had a great ride. Another went with a group up past the Northeast Carry to old trains. I do not know much about it but it is a great site to see Paul said. The ride was about 290 miles round trip, crossed 7 lakes and although a long day, had a fantastic ride. What is it really like on Big Wood? Yes we got snow 🙂 and Maggie LOVES running around in it. It looks like we got about 6+ inches here in town so far but we believe that the trails got more. 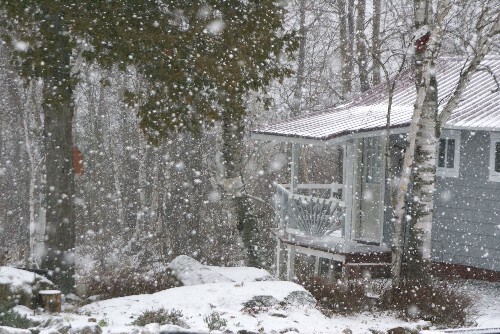 This is great for both snowmobiling and for winter fun! 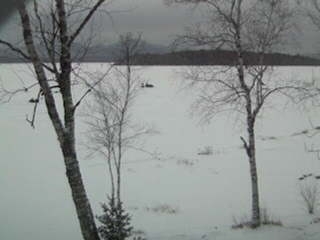 BRRR it is pretty cold out there but that is not stopping ice fishing on Big Wood. The lake seems alive today. I wish I could take a plane ride and do an aerial shot. 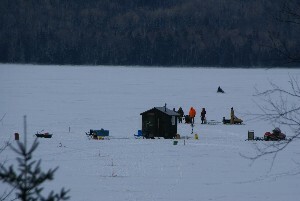 This one is one of Corey-s shacks surrounded by ice fishers and snowmobilers off in the distance heading out to the Lake Trail. We only got about 3 inches here in town but the trails got about 8 inches. 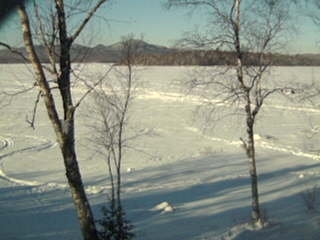 Groomers went out last night and most trails are looking pretty good according to the Border Rider Club. In town trails still need more snow as well as about the first 5 miles south, but the lake trail will take you right up to the clubhouse. 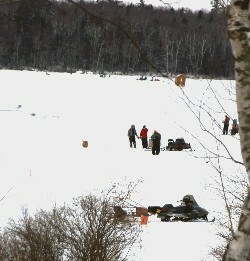 Even though the snow conditions are not optimal for snowmobiling this week, the ice fishing conditions were great. Although the temperatures were in the single numbers a couple mornings, the sun came out and very little wind. Our guests this weekend all did pretty good…Salmon, Splake and some really big Trout. Although the riding was exceptional for the end of 2010, the warm weather and rain did not fair well for the trails to begin 2011. Luckily, we have had extremely cold weather since then and the groomers have been out to try to make some of them ride-able. The Border Riders Club reports that conditions are closer to early spring riding right now with some areas of dirt or water. 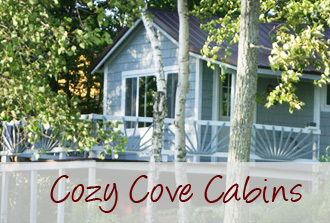 In town trails are not good at all but you can access the northern trails from your cabins across Big Wood. The northern trails (Border Riders Loop) seem to be the best of all at this point.